It's good to remember that your driveway gate is your responsibility. If you expect improved security, you need to first make sure it is properly protected too, from the elements, accidental damage, and any other potential threat. Most driveway gates are built to be strong but they can still be vulnerable to some problems, depending on the material they're made of and the surrounding conditions. When something goes wrong, the mechanism can turn from a convenient automatic entry system to your worst nightmare, acting up or refusing to move at all, creating major inconveniences and compromising your safety and security. You can deal with the human factor easily enough, but not with natural phenomena, right? Wrong! These days, technology and highly advanced materials can beat all odds as long as you agree to cooperate in order to help your gate resist the damage and keep problems at bay. It's certainly hard to deal with the wrath of nature, especially in harsh weathers and fierce winds, but you can still be prepared. Having the system maintained at the appropriate time is important because the gate will be able to remain stable even during the worst of weather. If the swing gate hinges are damaged or rusty, for example, it may get stuck trying to open and will require welding repair. A similar problem can affect a sliding gate system, should its track become bent or its wheels get damaged. That's why regular inspection and greasing of the necessary parts is so important. You'd be amazed at how relatively small preemptive actions can prevent or mitigate large-scale problems later on. The worst enemy of your gate is sun and moisture, two things it can't help but be exposed too constantly. Prolonged rainfall or too much humidity will have terrible repercussions on wood or wrought iron gates, which are not made from galvanized materials. For this reason, it's important to apply protective coatings to the frames and bars on a yearly basis. Fighting rust, rot and warping is a constant battle, but it doesn't need to be a hard one, provided you are persistent. We spoke about the human factor before, but it is often neglected and dismissed as not a major issue. Well, unfortunately, that's not the case. There have been many cases where people accidentally damaged their driveway gates with their cars, creating dents or fractures that then need to be repaired so that the system can move again. Apart from physical damage to the hardware parts, the electrical components of your automatic gate can also be susceptible to problems. An improperly installed intercom system or electric opener can develop problems later on and not necessarily on the day they're installed. It's very important that you avoid DIY work when it comes to your driveway gate, as unless you possess the necessary skills and experience, you may do more harm than good. Let expert technicians handle complex gate problems you encounter, and make sure that you don't try to perform any complicated installation work yourself, to avoid unintentionally causing problems. 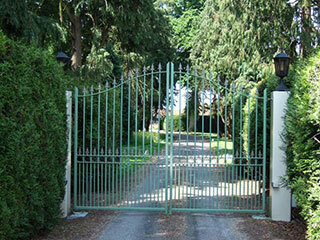 Our experts here at Gate Repair Thousand Oaks are at your service should you need help with anything.